If you aren’t familiar with the Montessori method, you may have many questions about our Montessori school in Leesburg. That’s why we have compiled a list of questions we frequently field. If you have any others, feel free to reach out and contact us for more information! There seem to be many Montessori preschools; do you offer Montessori classrooms for older students? Yes! At our Montessori school in Leesburg, we offer programs for children ages 2 ½ to 18. The reason there tends to be more Montessori preschools than programs for older students is that the method was first developed within in preschool population. As Dr. Montessori fine-tuned her approach, she extended it to children of all ages. The benefits of Montessori, such as the emphasis on independence and the supportiveness of the community, are important for all stages of a child’s development. What is the typical class size in your Montessori school? The size of the classroom varies between programs, but in general, we offer small class sizes to create a more intimate sense of community. For example, our high school program is significantly smaller than a traditional high school setting. This benefits the students as they get one-on-one attention from teachers and are able to get to know and forge connections with their peers. Our preschool classes are often bigger, between 20 to 30 children ages 2 ½ to 6 years old, so that older children can act as role models for the younger ones. If the students can just do whatever they want, how do they learn? Dr. Montessori’s observations of children found that allowing them to choose what they did motivated them to learn. In a Montessori classroom, students are able to choose their focus for the day from a limited selection of activities in each area of the curriculum. This sets students up for success in having autonomy and a sense of responsibility for their learning. 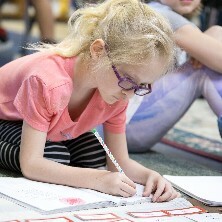 Starting in the elementary school setting, students learn to set their own academic goals and build out plans for learning with the guidance of their teachers. Why is there so much “work” in Montessori schools? It’s not that children don’t play in their Montessori classrooms; it’s that Dr. Montessori recognized that when children play, they are working, so all classroom activities are referred to as “work” to respect their efforts. While Montessori students are working hard all day, it doesn’t feel like a burden because they are following their natural desire to learn. While students may be working independently, that doesn’t mean they’re working alone. The role of the Montessori teacher is to carefully observe every student in the classroom and make sure they receive the appropriate materials to further their learning based on where they are. This gentle guidance empowers them by letting them work at their own pace without pushing them to get ahead of themselves, which is what truly causes children to fall behind. Does the school follow a curriculum? Montessori schools teach the same things that are learned in traditional learning environments, just in a different way. Instead of separating each subject from each other, the Montessori method involves a more integrated approach. For example, students might study the geography of Africa while learning about the culture, history, and art of several African nations. If they study Egypt, they will learn about hieroglyphics, which teaches them about writing, and the pyramids, which naturally teaches them about geometry. The idea is to teach the interrelatedness of all things and to allow students the ability to fully immerse themselves in a topic, guided by their curiosity. The main idea behind the Montessori method is to foster a child’s natural motivation to learn. Grades are an external reward that do not have a lasting impact on a child’s curiosity. The Montessori method is focused on teaching children to be self-sufficient without a need for external motivation. While the teacher guides and supports students, ultimately, it is the child’s personal drive that helps them learn. Though Montessori schools don’t give grades, teachers are intimately familiar with the progress of each child and what their needs are to move forward to new lessons. Can your Montessori school accommodate my child with special learning needs? The beauty of the Montessori approach is that each child is able to work at their own pace. In the multi-age classrooms, students with learning disabilities or other special needs do not feel the need to compare themselves to their peers because everyone is at a different level of learning. For children who are gifted in particular areas, they can move on to higher levels of learning and find intellectual stimulation without feeling separated from their peers. Students who need extra guidance and support are able to work at their own pace without the pressure of a traditional classroom setting to “keep up” with the rest of the class. At our Montessori school in Leesburg, we recognize that every child has special gifts, and the Montessori method allows them to explore and enhance those gifts at their own pace. 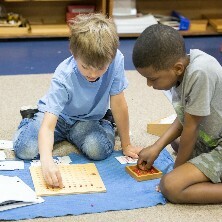 How well do Montessori students do compared to students in traditional schools? While the body of research into the comparison of Montessori schools and traditional schools is small, it is steadily growing. Thus far, studies suggest that Montessori students perform equally as well, and sometimes better, than peers in traditional schools. For example, one study made the link between Montessori preschool and elementary schools and success in standardized math and science tests in high school. In another study, the essays of Montessori students were found to be more creative and complex than essays written by their peers in traditional learning environments. In addition, Montessori students appear to have better social skills than non-Montessori groups. For example, research shows that they have a greater sense of justice, and are more likely to successfully navigate social dilemmas. Outside of research, anecdotal evidence shows that Montessori students are successful in life. It is typical for Montessori students to be accepted to the college of their choice, and there are many famous individuals who attended Montessori schools, including Jeff Bezos (founder of Amazon), Julia Child, Larry Page and Sergey Brin (founders of Google), Beyonce Knowles, and George Clooney. If you have any other questions about the Montessori method or our Leesburg school, we would be happy to help. Contact us today to learn more about our Montessori school in Leesburg!